Valentine Candy Gift basket a perfect Valentine gift for adults or kids. You will find all kinds of Valentine candy in this gift basket. The perfect candy gift basket for anyone. Design of chocolate sucker and heart shaped box of candy may vary. 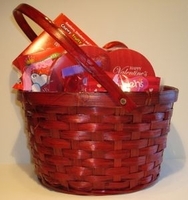 Each basket is a red wicker basket making it perfect for your Valentine.